The Western Front, Christmas, 1914. Out of the violence comes a silence, then a song. A young German soldier steps into No Man’s Land singing Stille Nacht (Silent Night). Thus begins an extraordinary night of camaraderie, music, peace. Re-live this remarkable true story from WWI through the words and songs of the men who lived it. The original cast recording from the highly acclaimed collaboration between Cantus and Theater Latté Da is now available. 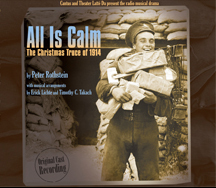 Enjoy this radio musical drama for holiday seasons to come. By Peter Rothstein, with musical arrangements by Erick Lichte and Timothy C. Takach. All Is Calm is only available as a CD and cannot be purchased as a download. 1. Will Ye Go To Flanders?